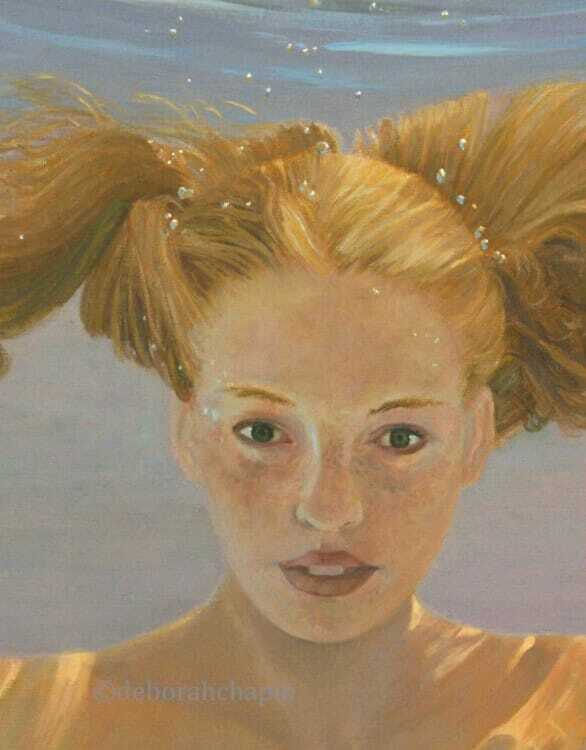 This painting part of a series of underwater portraits in women painting women movement by Deborah Chapin is about the interior thoughts of another. However no matter how much we know about someone else we never really know them completely. The mysteries of another's thoughts is always going to leave you wondering. This portrait of the interior mind is depicted by "Penny for Your Thought" 20x30 oil on linen by Deborah Chapin. Water often represents the border between this world and that of dreams. Suspending time and space, allowing the painting process to begin by creating shapes and patterns while in the water and then evolving the subject matter as it goes through the painting process. To more information about this project see the introduction of "Book of Water"
About the Process: The Above slide shows how this piece progressed going backwards if that makes sense. Part of the Water Portraits of Women. This piece took several turns in the evolution. I at first started it as a 24 x 36 and although I was really pleased with the portrait I had to say when I started putting the reflection in I wasn’t pleased because it became so dominate in the painting and a quiet thoughtful portrait started to disappear, so I took it out. Then it sat there an looked at me for awhile and I wasn’t happy with it still so I made the decision to cut the painting down. I ended up with a 20 x 30 but I think as a painting it works much more now than it ever did with the reflection just a few bubble to suggest that the model was underwater. This series of portrait paintings is new work to my portfolio. In my youth I was a competitive swimmer and so am very comfortable underwater although it did require learning some diving skills to stay underwater since I am naturally buoyant. After about 2 months of practicing however with weights I managed to sink. I also worked at expanding the time underwater through controlling my breathing until really the limitations now are equipment rather than my breathing. Part of Women Painting Women Movement. The next 30 years I expect to be doing a combination of unusual water portrait work and collector’s favorite, my beach scenes with people. If you have questions feel free to ask.